Photographer Quinn Parker is getting married in a month, and she’s almost happy about it. Even though her mother is planning the whole wedding. Even though she’s secretly had the hots for Simon Chase forever. But he’s her best friend’s brother and her coworker…off-limits even if she were single. So she’s marrying the man who should be her perfect match—and that’s that. Simon Chase’s life revolves around his family’s storm-chasing business. The meteorologist of the bunch, he’d rather be out in the weather than reporting it—especially if Quinn Parker is along to photograph the run. He’s been hiding his crush on her for a long time, and it’s only intensified. But she’s marrying someone else—and that’s that. Or is it? When a Chase family wedding sets the stage for body temperatures to rise and the pressure of Quinn’s impending wedding to build, a new reality breaks. Quinn and Simon discover their unrequited affections have been mutual all along. When the gathering storm of their attraction finally reaches its peak, will it leave their lives in shambles? Or will they find shelter in each other? The Sweetest Chase is appropriately titled. Simon is all kinds of sweet, as is Quinn. While I did really enjoy their story, I didn’t find it to be the perfect storm. The back and forth and general nature of where the story went took a long time to get going, in my opinion. I loved the flirty attraction between Simon and Quinn and enjoyed the interactions with all the quirky family members. The deeper moments were well written and where I found myself connecting the most. 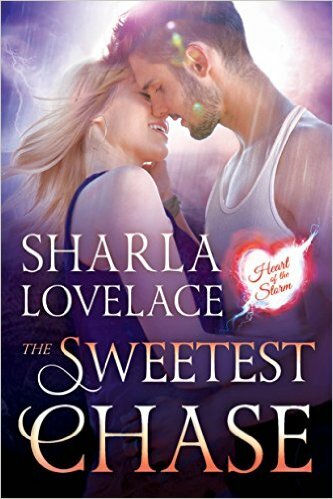 I would definitely recommend The Sweetest Chase to anyone looking for a friends-to-lovers light romance.